General Motors has received three final bids for its struggling Opel business, which includes Vauxhall in the UK. Canadian car parts maker Magna, Belgian-based investor RHJ International and China's Beijing Automotive Industries are the bidders. Magna, backed by Russia's Sberbank, has made a last-minute change to its bid in order to placate concerns about its Russian partner's influence. It remains the favourite to buy a majority stake in Opel. "General Motors confirms that it has received final offers for a stake in Opel/Vauxhall from three bidders. The final bids will now be analysed and compared by GM," GM said in a statement. "The final bids as well as GM's preliminary findings will then be reviewed with the German and other impacted governments, the EU Commission and the Opel/Vauxhall Trust Board," it added. The Magna consortium had looked to certain to win the battle for Opel since May, when the German government supported the move. However, talks stalled after Magna wanted intellectual property and distribution rights in Russia to be included in any deal. This is something that GM has been unwilling to concede. Magna has, therefore, altered its bid, diluting Sberbank's stake. Instead of Magna taking 20% and Sberbank taking 35% of Opel, the two partners are now proposing an equal share - 27.5% each. GM was forced to put Opel up for sale as part of its massive restructuring that saw it go into Chapter 11 bankruptcy in the US - before emerging as a leaner company with less debt. 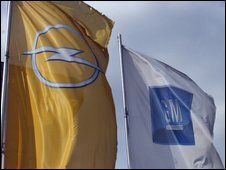 Opel has been placed under the ownership of a trustee in which both GM and the German government have a stake - making the process of deciding a buyer complex. And last week, German Chancellor Angela Merkel and Russian President Dmitry Medvedev voiced their support for Magna. However, Opel's future has become less clear-cut after RHJ, which is backed by US private equity firm Ripplewood, said last week that its negotiations with GM and Germany were "at an advanced stage". Both firms' plans are thought to involve cutting about 10,000 Opel jobs - and protecting all four German car-making plants. Magna has now said that "no immediate plant closures are contemplated" at the Vauxhall sites at Luton and Ellesmere Port, which employ about 5,000 people. However, that commitment has only been made to 2013. RHJ is also expected to support saving both Vauxhall factories - but may ask workers to take pay cuts. GM is expected to give its preliminary findings on the final bids to the German and other European governments on Wednesday. Next week, GM is expected to have a recommendation ready on which bid to accept. That will be put before its board and the US Treasury, which has a majority stake in GM.